This Karcher Liberty hot water pressure washer is built with a powder - coated steel cage, gas powered engine, diesel heated coils and 4 wheels for unmatched mobility and cleaning power. Built on a rugged 1-1/4 inch powder coated steel frame, these compact gas roll cage models are designed for construction sites, farms and factories. The different models deliver hot water cleaning of up to 3500 PSI. 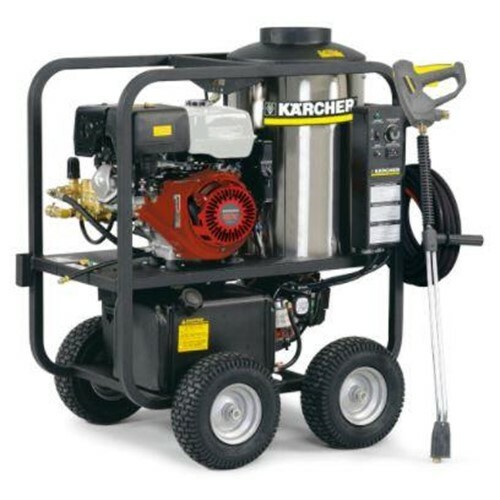 Each features a Karcher pump with limited 7 - year warranty, industrial-grade motor and flat - free tires. All are certified to UL and CSA safety standards.